This Fact Sheet includes foundation requirements and recommendations for elevated homes. The Fact sheet summarizes key concepts of the National Flood Insurance Program (NFIP), describes the typical damaged foundation types observed after Hurricane Sandy, and offers design guidance for elevating homes by retrofitting with deep foundations. 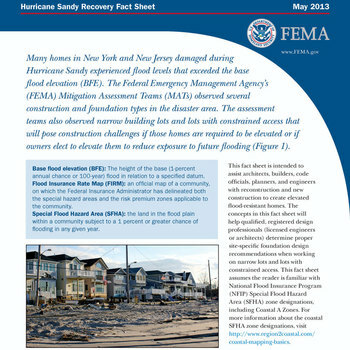 This Fact Sheet builds on information provided in FEMA’s Recovery Advisory, Initial Restoration for Flooded Buildings (2005), prepared after Hurricane Katrina. It offers information on correctly cleaning and drying buildings that were not adequately cleaned and dried shortly after the Hurricane Sandy flooding. The advisory describes the selection and application of appropriate cleaners as well as the equipment and process needed to properly dry the building prior to any restoration efforts. Prefabricated safe rooms are becoming more popular as people seek protection from tornadoes. Due to the extreme forces safe rooms may experience, there are very specific foundation and anchoring requirements that, if overlooked, can leave occupants at risk of injury or death during tornadoes. This fact sheet provides graphics and useful information about the foundation and anchoring criteria in FEMA P-361, Safe Rooms for Tornadoes and Hurricanes: Guidance for Community and Residential Safe Rooms, Third Edition, which uses ICC 500, Standard for the Design and Construction of Storm Shelters, as a referenced standard. FEMA has numerous publications describing best practices that can be used when rebuilding after a flood event. This flyer summarizes some of the readily available publications and resources that can be used by homeowners, communities, and all involved in reconstruction activities following the flooding in Louisiana. Safe room door assemblies are one of the most important components of a safe room because they must provide the same level of protection as the walls and roof, yet also remain functional for quick access. This fact sheet provides information about the selection, installation, and maintenance of safe room door assemblies for community safe rooms. It is recommended that safe room door assembles are regularly maintained to protect their functionality and maximize their life span. The fact sheet covers what should be checked and how often, as well as several solutions related to the maintenance of safe room door assemblies. While the fact sheet discusses community safe room door assemblies, some of the information in the fact sheet is pertinent to owners of residential safe rooms.